Alexandra Berlinger und Wolfgang Fiel sind unter dem Namen tat ort in den Bereichen Bildende Kunst, Architektur und Urbanismus tätig. Nach über einer Dekade des gemeinsamen Arbeitens haben sie nun für den Kunstraum Engländerbau unter dem Titel HISTORY IN THE MAKING eine Rauminstallation entwickelt, die sie als retroaktives Manifest ihrer künstlerischen Praxis verstehen. Ein häufig wiederkehrendes Motiv ist dabei ihre Auseinandersetzung mit der temporären Formation kollektiver Prozesse und den dabei ausgetragenen Konflikten. In vielen Fällen bleibt die Arbeit des Künstlerduos auf die Zeit beschränkt, die sie vor Ort verbringen und dort oft mehrere Wochen in einen gegebenen Kontext eintauchen. Dass selbst die Konstitution des physischen Raums davon nicht unberührt bleibt, zeigt sich nicht zuletzt an den temporären ‚Apparaturen‘, die Berlinger und Fiel für ihre Interventionen konstruieren. Sie beschäftigen sich dabei unter anderem mit der Frage, inwieweit diese Strukturen potentiell auf unsichtbare/verborgene Prozesse verweisen können und dabei zwischen eigenständiger Form und funktionalem Hilfsmittel changieren. Im Gegensatz zu den unterschiedlichsten Objekten und Materialien die in ihren Arbeiten zum Einsatz kommen, verstehen sie die geschaffenen Environments als Katalysatoren von Prozessen, die im Idealfall den Zeitraum der ursprünglichen Inszenierung überdauern. Wichtiger Bestandteil ihrer Werkdokumentation ist die minutiöse digitale Archivierung der eingesetzten Mittel, die ihnen erlaubt, die eigene Entwicklung retrospektiv als vielschichtige Sequenz diskreter Ereignisse zu begreifen, deren ‚Spuren‘ einen Namen tragen, denen sie die Treue halten. Die digitalen Ressourcen ausgewählter Arbeiten werden für die Ausstellung zu einer imaginären Großform innerhalb der räumlichen Begrenzungen des Engländerbaus assembliert, die aber lediglich mittelbar angezeigt, vorgebracht, eingefasst oder abgetastet wird. Die zu diesem Zweck verwendeten handelsüblichen Mikrofonstative sind die justierbaren Träger eines jeweils an deren Ausleger montierten Passstücks, das der Kontur der imaginären Skulptur an einer bestimmten Stelle nachgeformt ist, und sich somit in ihrer Gesamtheit zu einem räumlichen Ensemble verdichten. Die Installation ist die physische Manifestation einer historischen Fiktion. Die zur Ausstellung erscheinende Publikation dokumentiert die digitalen Ressourcen der ausgewählten Projekte und liefert somit den Bauplan zur räumlichen Inszenierung. The artist duo tat ort (Alexandra Berlinger/Wolfgang Fiel) use just a small part of the 300 square meter surface that was made available for their current exhibition. Here, emptiness is put on show. Several dozen filigree pink objects on slim microphone stands are grouped around the empty centre of this new installation History in the Making (2013). Their new work stays quite unpretentiously in the background and thus highlights the conditions that the white cube creates for art. tat ort are two workers on and in context. Their works always indicate the context in which they are operating. With the emptiness surrounded by microphone stands and pink objects in the present installation, they systematically include questions as to the conditions of art presentation, to the inside and the outside, and the necessity of always having to show a physically present object. But this space is still full to the brim with references to the outside world. On the occasion of their “retroactive manifesto” (Berlinger/Fiel), the artists have included five years of joint work here. A total of 14 projects undertaken between 2006 and 2011 converge. Not, however, in the form of a retrospective which would exhibit each and every one. Instead, the two artists decided to bring their previous works together in a new constellation. 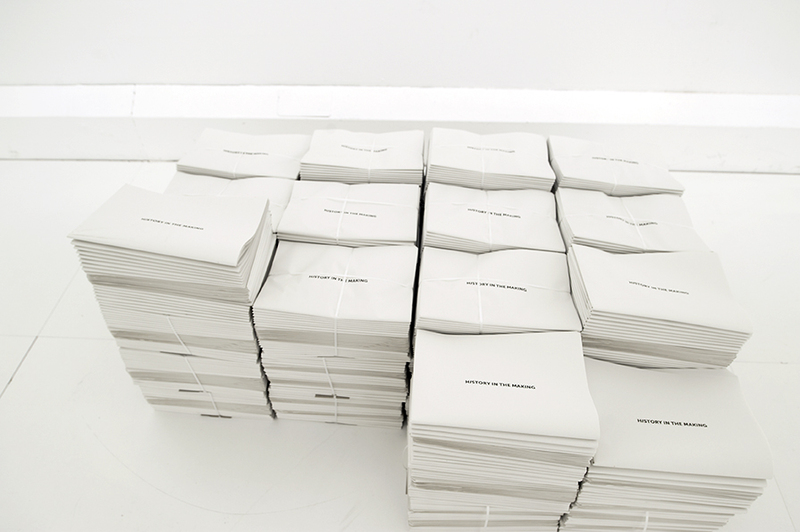 tat ort possess a meticulous digital archive (online and on digital storage media), in which all their works can be seen in virtual form. In particular, for all the works not exhibited, there is a millimetre precise CAD drawing, showing the construction with every single element used, from wooden boards, to wheels, to supporting frames, trestles, or even screws. The entire material that Berlinger und Fiel have worked with over more than ten years together is archived in these files and can be viewed at any time. And this is exactly what the artist duo do with the works selected for History in the Making. In a new 3D drawing, they have placed all the material inside a model of the Engländerbau. To do this, they had to divide everything into its parts, to layer and stack the material and then unstack it again. The result is an almost three-metre-high and about five-meter-broad and eight-meter-long “pile” of more than two dozen joint works – a virtual grand artwork, in the virtual Engländerbau. 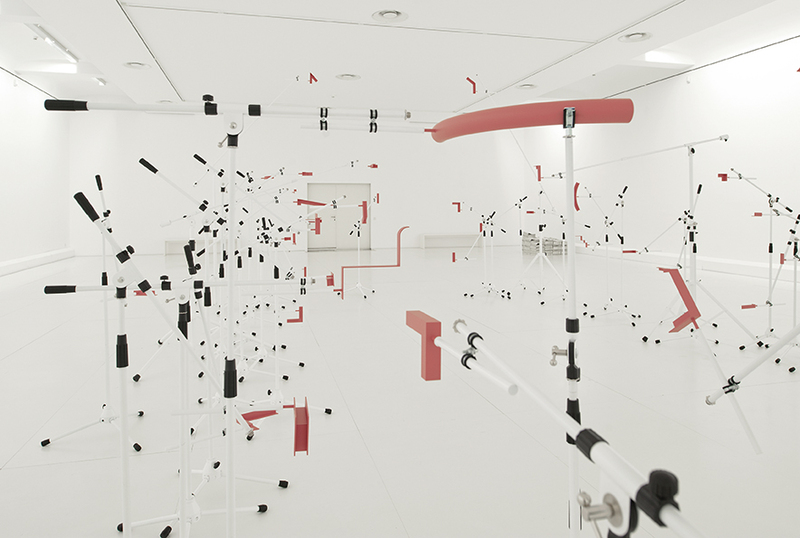 Berlinger and Fiel have used 47 microphone stands in order to delineate the difference between what is present only virtually and the empty space. Each stand has its own position, more or less bent over or twisted. Onto them, welded and varnished steel objects of differing form and size (triangular, L-shaped, flat square plates, tubes or pipes) have been attached. With a particular shape and a position in the room, each of these objects marks a precisely defined place in the structure of History in the Making. These are basically first impressions that give spatial substance to what is physically not present, and that create the context of the individual projects. While the microphone stands are aids that bring the pink geometrical objects into the right position, the latter very precisely correspond to the prominent corners, conspicuous edges, or special indents in the imaginary stack of material. They provide a frame for what the visitors to the exhibition cannot see. It is no coincidence that the two artists did not just decide to arrange in the exhibition space everything that they have made together over a decade working together, as a retrospective project would most likely do. They wouldn’t even be in a position to do this if they wanted to. Their artistic practice is characterized by work that is mostly bound to a specific time and context. What remains after that are documentary photographs and digital visuals of the constructions with which tat ort operate on site or which are created on site. When Berlinger and Fiel have moved on, then the physical objects have usually gone. Once again: none of these works described exists today in its original state. The digital documentation is a phantom of what once was. In this respect, tat ort have created a ghostly presence in the Engländerbau. The seemingly weightless, pink shapes do not only define the spatial form of the sculpture. They feel their way around the virtual sculpture, point out special parts, and enclose a space of memory that Berlinger and Fiel have developed with History in the Making.